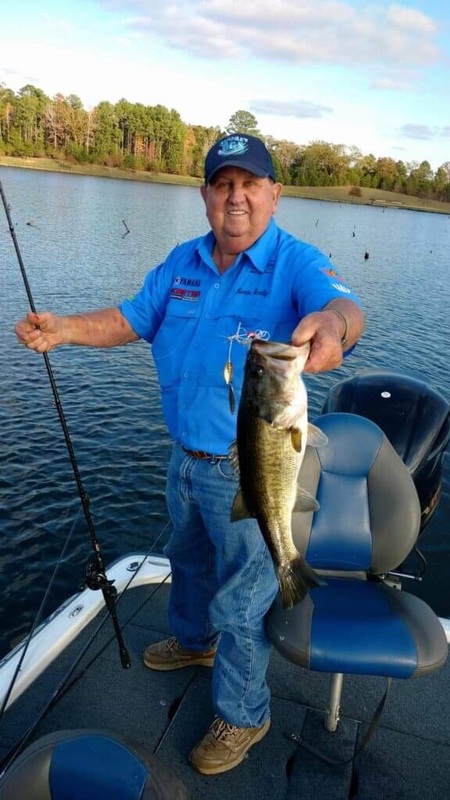 Lonnie Stanley grabs a big bass that bit his new, reintroduced “Code-Red” VibraWedge spinnerbait. Give angler William Flournoy a spinnerbait with a red head — and he’ll catch bass. Give Flournoy a spinnerbait with a red head and a tapered wire shaft that goes from .041 to .018, and he’ll put even more bass in the boat. He does that with Stanley’s new “Code-Red” VibraWedge spinnerbait manufactured by his great-uncle, Lonnie Stanley of Huntington, Texas. Stanley has reintroduced the tapered wire shaft spinnerbait that was such a force in the 1980s for Tommy Martin, John Torian, Larry Nixon and even Rick Clunn, who won a U.S. Open with it in 1983 at Lake Mead, Nevada. And the legendary artificial lure manufacturer has added a red head, which, as far as his great-nephew is concerned, is the coup de grace. The accomplished bass pro said some bass anglers like to match a spinnerbait head to a skirt color. 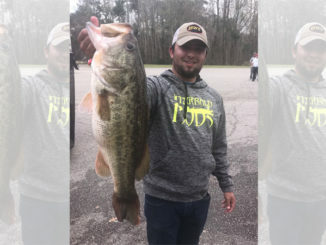 The 35-year-old said he was using the red-headed, tapered-wire shaft spinnerbaits with their hand-tied skirts to catch quality bass around cypress trees and edges of hydrilla beds at Lake Sam Rayburn. Soon, the Code-Reds will be in stores in many southern states. 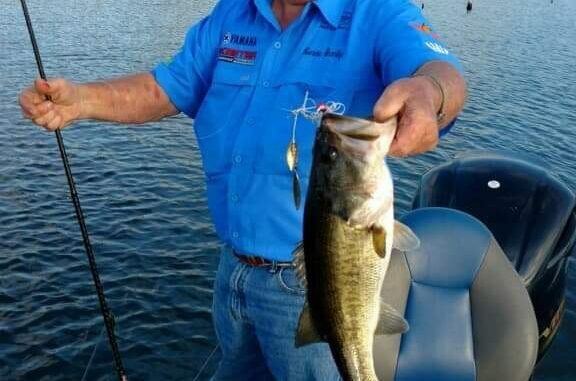 Bass anglers in the region should start having as much success with them as their counterparts at Lake Sam Rayburn and nearby Toledo Bend. 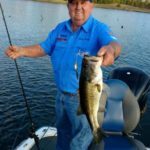 “Once you throw the red spinnerbait with the tapered wire, it feels so much better than any spinnerbait made,” Stanley said. 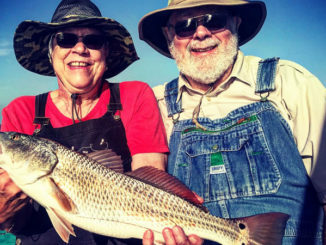 He notes it’s the only artificial lure he knows about that had three patents (since expired) for the tapered wire, wedge-tapered blade and hand-tied skirt. “We did all that (acquire the patents) back in the 80s. It’s still something we’re proud of,” he said. Martin and Clunn, he said, still throw the spinnerbait they first started casting in the early 80s. Now everyone else has a chance. “That’s our old-time spinnerbait we’ve reintroduced,” he said. 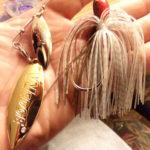 According to Flournoy, the tapered wire (shaft) is the key to the spinnerbait’s success. “Well, the tapered wire actually serves many purposes. No. 1, it allows the blades to pull back a little bit and run truly. With the blades running with less resistance from a tapered wire they get more vibration. The biggest thing to me is it (tapered wire shaft) lets the blades run true and you can slow-roll them better,” he said. Also, the tapered wire is more flexible, and collapses easier. 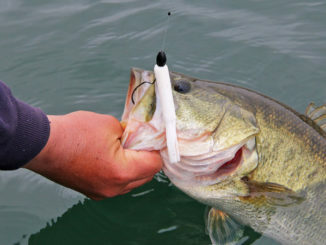 That’s important, he said, because when a large bass inhales the spinnerbait, blades and all, the flexibility allows the fish to get hold of the hook — and the hook set is rock solid. 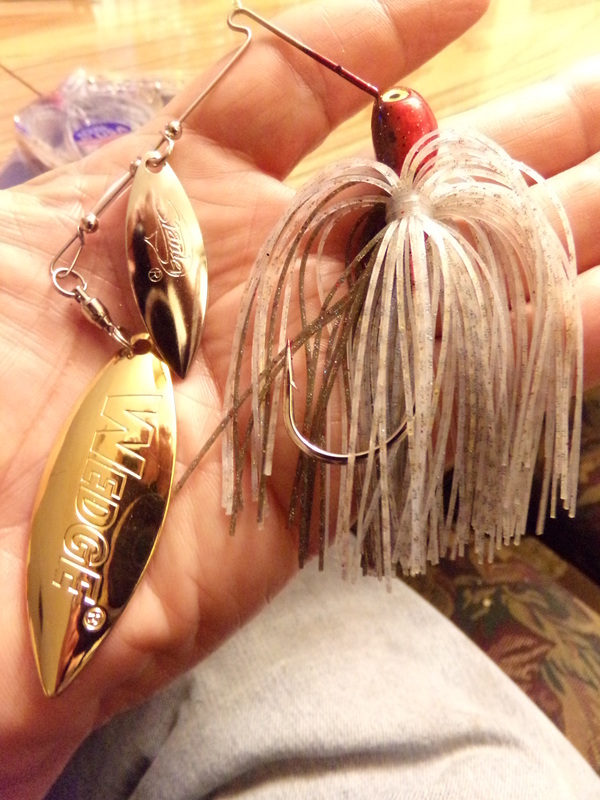 Also, if a bass doesn’t get the whole spinnerbait, the tapered wire shaft allows it to get the hook easier, he said. “In my opinion, it’s the way a spinnerbait’s supposed to be made,” he said. He also favors the “R” bend as opposed to the twist wire to tie the “Code-Red” VibraWedge to the business end of his fishing line. “It’s a personal preference. 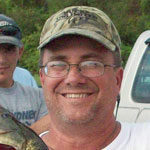 Everybody’s opinion is different,” he said, adding that he has caught as many as 70 to 80 bass on one of the new spinnerbaits. On the rare occasion one broke, he said, it was because he was hauling hawgs out of thick brush this past spring at Toledo Bend. For more information on the “Code-Red” VibraWedge spinnerbait and other Stanley Lures products, go to www.fishstanley.com or call (936) 876-5713.